The GB Compact is the newest member of the GumBusters range. 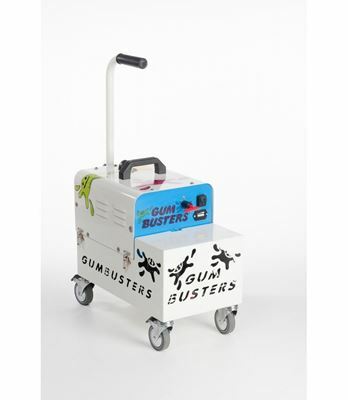 Exactly as the name suggests this is a compact version of the world’s first cordless dry steam machine for gum busting. Ideal for use Operating using a single 12-volt battery and able to run for up to 2 hours; this compact version boasts all of the same features as its larger team mate. Cordless, quiet and simple to use, the GB Compact requires one overnight charge and operates using a simple START/STOP system. Best suited to indoor or front of house applications, the compact nature of the machine means it can be easily used in confined spaces yet the robust caster wheels ensure this remains a multi-terrain machine and can just as easily be used outdoors. Ideal for use during the day and in densely populated areas; the GB Compact can be used without causing any nuisance or disturbance due to it being virtually silent during use. The Compact also features a unique optional integral storage battery back container underneath the machine which extends the run time by a further 2 hours.